Note to readers: this page will be updated regularly through the New Year's Holiday (from December 30 through January 2) with videos and LIVE twitter feed (below) as Alex Thomson on HUGO BOSS (without starboard foil) and Armel Le Cleac'h on BANQUE POPULAIRE VIII engage in an epic struggle for first place at the front of the Vendée Globe fleet, moving north in the Atlantic Ocean. Video above published Dec 31, 2016: After a successful repair job onboard HUGO BOSS, Alex Thompson can now get some sleep, he'll need the rest for the upcoming passage through the doldrums and to keep making gains on Armel Le Cleac'h on BANQUE POPULAIRE VIII. Video above published Dec 30, 2016: Alex Thomson on HUGO BOSS has gained hundreds of miles on the Vendee Globe leader Armel Le Cleac'h on BANQUE POPULAIRE VIII, since rounding Cape Horn--what a comeback! Vendée Globe Weekly highlights published December 30, 2016. Vendée Globe Day 53 daily highlights video above published Dec 29, 2016. Vendee Globe Update Dec 29, 2016: In the Vendee Globe 2016-17 solo non-stop round-the-world sailing race, Alex Thomson on HUGO BOSS (2nd) made an unbelievable comeback to close within miles of Armel Le Cleac'h on BANQUE POPULAIRE VIII in first--less than 75 nautical miles separated the two as of Dec. 29 at 18h in the South Atlantic (see graphic above) and less than 35 nautical miles later at 22h. The Vendée Globe race record is held by François Gabart, who finished after 78 days. The eighth Vendée Globe began from Les Sables d'Olonne, France, on Sunday, 6th November 2016. Jim Delegat’s Giacomo is confirmed as the overall winner of the 2016 Rolex Sydney Hobart Yacht Race. Giacomo, a 70-ft yacht from New Zealand, becomes the first overseas yacht to win the race since 2007. Victory is reward for an excellent and consistent race and is a triumph of persistence. Two years ago, Giacomo was forced to retire from the Rolex Sydney Hobart after she dismasted off the Tasmanian coast. After a year rebuilding the boat, the crew returned for the 72nd edition of the race determined to make amends for that disappointment. After finishing just under two hours behind line honours winner Perpetual LOYAL, and registering the second fastest time in the race’s history, overall victory was confirmed when the pursuing yachts hit fickle conditions in Storm Bay and along the Derwent River. Reward for this outstanding success came in the shape of the Tattersall’s Cup and a Rolex Oyster Perpetual Yacht-Master 40. Video above published Dec 27, 2016: The race record has been broken in the Rolex Sydney Hobart Yacht Race. Arriving in Hobart at 02:31.20 on Wednesday 28 December, Anthony Bell’s Perpetual LOYAL set a a time of 1 day, 13 hours, 31 minutes and 20 seconds, some 4 hours, 51 minutes and 52 seconds faster than Wild Oats XI’s 2012 record. Taking advantage of a consistent breeze throughout the 628-nautical mile race, Perpetual LOYAL enjoyed close competition with eight-time line honours winner Wild Oats XI, assuming leadership of the race shortly after the latter’s retirement. It was a lead she preserved during the final stages of the race along the eastern coast of Tasmania and down the Derwent River to the finish line in Hobart. During the line honours presentation held on Constitution Dock in Hobart, Bell and his crew were rewarded for their remarkable exploits with the J.H. Illingworth Trophy and a Rolex Yacht-Master II timepiece. Rolex Sydney Hobart Yacht Race Line Honors: @PerpetualLoyal crossed the line in Hobart at 2:31.20am on Wednesday December 28, 2016--Official race time for Perpetual Loyal: 1 day, 13 hrs, 31 mins, 20 secs.--Beats Wild Oats XI 2012 record by 4hrs, 51 mins, 52 secs. UPDATE: Records are set to be broken at the 2016 Rolex Sydney Hobart Yacht Race as the fleet makes rapid progress through the Bass Strait on route to the finish line in Hobart, Tasmania. The Rolex Sydney Hobart is always an unforgiving and unpredictable race and this year’s 72nd edition is proving no exception. Anthony Bell’s Perpetual LOYAL leads the fleet and together with a number of frontrunners is sailing well within the race record time. The holder of that record and eight-time line honours winner, Wild Oats XI, was forced to retire from the race after sustaining keel damage. She was leading the race at the time. Further twists and turns are expected in the coming hours as Hobart prepares for the arrival of the first boats. UPDATE: Wild Oats XI confirms retirement - Rolex Sydney Hobart Yacht Race 2016: "Wild Oats XI retires with keel damage --News from Australia, Tuesday, December 27, 2016 12:00 PM"
The 2016 Rolex Sydney Hobart Yacht Race is underway. A fleet of eighty-eight yachts from eleven countries, and comprising four 100-ft Maxi yachts, are contesting the 72nd edition of this famous 628-nautical mile offshore race. On a perfect Sydney summer’s day, and with hundreds of thousands of specators watching on from the city’s numerous vantage points, the fleet provided a stunning speactacle sailing under spinnaker. Among the Maxis, Perpetual Loyal made the most impressive start and was the first yacht to clear Sydney Heads and begin the charge down the New South Wales coast of the Tasman Sea. The Rolex Sydney Hobart is revered throughout the world. Its legend, heritage and distinctive slot in the international sporting calendar have ensured it is one of few sailing events to have genuinely entered the public consciousness. Rolex has been Title Sponsor of the race since 2002. 2016 Rolex Sydney Hobart Yacht Race: Over the past 71 years, the Rolex Sydney Hobart has become an icon of Australia's summer sport. No regular annual yachting event in the world attracts such huge media coverage than does the start on Sydney Harbour on Boxing Day, December 26, 1:00 pm local time in Sydney, Australia. Video above published Dec 28, 2016: Vendée Globe day 52 daily highlights. Vendee Globe Update Dec 28: Alex Thompson on HUGO BOSS closes within 255nm of leader Armel Le Cleac'h on BANQUE POPULAIRE VIII in the Vendee Globe 2016-17 solo non-stop round-the-world sailing race. Video above published Dec 27, 2016. Vendee Globe video above published December 26, 2016. 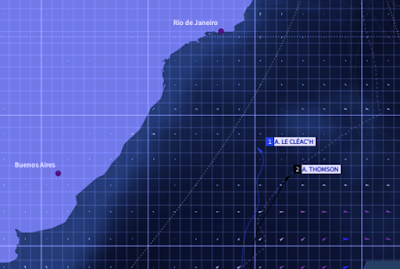 Vendée Globe Day 50: Alex Thomson on HUGO BOSS passes Cape Horn. Vendée Globe Day 47 Daily highlights video published Dec 23, 2016: First-place leader Armel Le Cleac'h on BANQUE POPULAIRE VIII passes Cape Horn! Alex Thomson on HUGO BOSS, in second place, should pass Cape Horn on Christmas Day, December 25th. Vendée Globe Day 46 Daily Highlights Video published Dec 22, 2016. 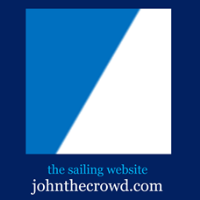 UPDATES and LIVE Twitter feed at JohnTheCrowd.com: Vendée Globe Daily Updates, Sailing Videos, Dec 29 - Jan 2. Video above published Dec 21, 2016--a 'very chipper' Alex Thomson--"support has been incredible, knowing you guys are behind him means the world to Alex so keep it coming!!" Armel Le Cleac'h on BANQUE POPULAIRE VIII (1st) and Alex Thomson on HUGO BOSS (2nd) are currently leading the fleet headed east across the Pacific Ocean towards Cape Horn at the southern tip of South America. Vendee Globe Update: In the Vendee Globe 2016-17 solo non-stop round-the-world sailing race, Armel Le Cleac'h on BANQUE POPULAIRE VIII (1st) and Alex Thomson on HUGO BOSS (2nd) are currently leading the fleet headed east across the Pacific Ocean towards Cape Horn at the southern tip of South America. Video above published Dec 19, 2016: Vendee Globe Day 43 Daily highlights - a Vendée Globe racing yacht collision with a container adrift in the ocean? Vendee Globe Update: Armel Le Cleac'h on BANQUE POPULAIRE VIII (1st) and Alex Thomson on HUGO BOSS (2nd) are currently leading the Vendee Globe fleet heading for Cape Horn at the tip of South America. Vendee Globe Update: Armel Le Cleac'h on BANQUE POPULAIRE VIII (1st) and Alex Thomson on HUGO BOSS (2nd) are currently leading the fleet in the Vendee Globe sailing race. Video above published Dec 15, 2016: Heading east for a Christmas around Cape Horn, all is well with Alex Thomson onboard HUGO BOSS. He is concentrating on staying fast in second making up miles when given the opportunity. Vendee Globe Update: Armel Le Cleac'h on BANQUE POPULAIRE VIII (1st) and Alex Thomson on HUGO BOSS (2nd), lead in the Vendee Globe sailing race. The CYCA's SOLAS Big Boat Challenge, one of Sydney's most spectacular sporting and harbour fixtures, has for 23 consecutive years marked the start of the Rolex Sydney Hobart lead-up events. Video above published Dec 13, 2016: Alex Thomson, skipper of HUGO BOSS, has been through 2 uncomfortable depressions this week, he's still smiling and still in the race. Alex now has to cross The Pacific Ocean before passing Cape Horn. Video above published Dec 12, 2016: Lighter winds in The Pacific today, Alex enjoys the respite as he waits for the wind he needs to keep up with Voile Banque Populaire. Vendee Globe Update: Alex Thomson on HUGO BOSS and Armel Le Cleac'h on BANQUE POPULAIRE VIII are currently leaders in the Vendee Globe sailing race. Vendee Globe Update: Alex Thomson on HUGO BOSS and Armel Le Cleac'h on BANQUE POPULAIRE VIII leaders in the Vendee Globe sailing race. Video above published Dec 11, 2016: Check out some of the best footage from the first foiling year of the Extreme Sailing Series™, which saw the fleet of super-fast hydro-foiling GC32s travel the globe, stopping in Muscat, Qingdao, Cardiff, Hamburg, St Petersburg, Madeira Islands, Lisbon & Sydney on the way. Vendee Globe Update: Alex Thomson on HUGO BOSS and Armel Le Cleac'h on BANQUE POPULAIRE VIII are currently the leaders in the Vendee Globe sailing race. Video above published Dec 12, 2016: Alex Thomson is all smiles onboard HUGO BOSS after a successful day reigning in Voile Banque Populaire's lead. Time to prepare the boat before it enters another low pressure weather system this evening. Vendee Globe Update: Alex Thomson on HUGO BOSS and Armel Le Cleac'h on BANQUE POPULAIRE VIII are currently the top 2 leaders in the Vendee Globe sailing race. RORC Transatlantic Race: Maverick Blasts into Grenada: "Maverick Blasts into Grenada Day 15: RORC Transatlantic Race: Infiniti 46, Maverick, skippered by Oliver Cotterell crossed the finish line outside Camper & Nicholsons Port Louis Marina, Grenada at 06h 52m 09s on 10th December 2016. The British yacht, with radical side foils is provisionally the winner of IRC Canting Keel and currently placed second overall under IRC for the RORC Transatlantic Race ..."
Vendee Globe Update: Alex Thomson on HUGO BOSS and Armel Le Cléac’h on BANQUE POPULAIRE VIII are currently the leaders in the Vendee Globe sailing race. Kings of cool Alinghi win Sydney finale to secure third Extreme Sailing Series™ title | News: "Swiss team Alinghi were crowned 2016 Extreme Sailing Series™ champions today after an epic final-day shoot-out at the season finale in Sydney. In a nail-biting showdown that went right down to the wire, Arnaud Psarofaghis’ men saw off a last-ditch attempt from arch rivals Oman Air to complete their ascendancy to the top of the 2016 rankings. 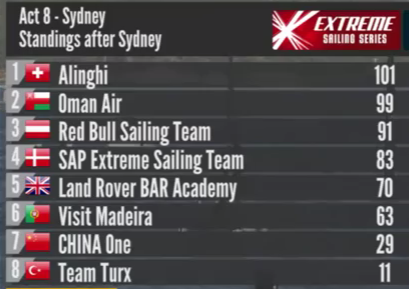 It’s the third time Alinghi have won the Extreme Sailing Series following victories in 2008 and 2014 but the first time they’ve done so ‘flying’ on the new lightning fast GC32 catamarans ...." more at link above and Extreme Sailing Series 2016, Sydney, Australia, Dec 8-11, LIVE Video. Video above published Dec 9, 2016: As the low pressure weather front follows Alex Thomson aboard HUGO BOSS towards the southern tip of New Zealand, life becomes increasingly uncomfortable for the two Vendee globe front runners and they are buffeted around by increasingly strong gusty wind conditions. Vendee Globe Update: Alex Thomson on HUGO BOSS (2nd) and Armel Le Cleac'h on BANQUE POPULAIRE VIII (1st) are currently leading the Vendee Globe sailing race. Video above published on Dec 8, 2016: Tough couple of days ahead for Alex Thomson, but as you can see the sense of humour has not been lost. Sailing conservatively, focusing making it to the horn in one piece. Video above published Dec 7, 2016 by Vendee Globe as "J32 : Images de bord de Sébastien Josse"
Video above published Dec 6, 2016: One month ago to the exact day, Alex left Les Sables d'Olonnes and started the Vendée Globe. Since then he has been at the front of the fleet in battle with French rival Armel Le Cleac'h, as well as breaking three race records. This week Alex had a special visit from the Marine Nationale helicopter just off the Kerguelen Islands, capturing some of the most stunning footage of an IMOCA 60 to date. Vendee Globe Update: Alex Thomson on HUGO BOSS (2nd) and Armel Le Cleac'h on BANQUE POPULAIRE VIII (1st) are currently leading in the Vendee Globe sailing race. Vendee Globe, Day 29: Magnificent sunset filmed by Yann Eliès. Vendée Globe video published Dec 5, 2016. Vendee Globe Update: Alex Thomson on HUGO BOSS (second) and Armel Le Cleac'h on BANQUE POPULAIRE VIII (first) are still leading in the Vendee Globe sailing race. RORC Transatlantic Race Update Day 9: The Italian MOD70, Maserati has finished the RORC Transatlantic Race; Phaedo3 has been declared the winner of the Multihull Trophy and Mike Slade's Maxi, Leopard is on the hunt for the monohull record. Video above published Dec 3, 2016: Neck and neck with Voile Banque Populaire! Alex Thomson onboard HUGO BOSS is looking forward to starboard tack! Daily highlights video above published Dec 1, 2016. Video above published December 1, 2016, Vendee Globe sailing race. Vendee Globe Update: Alex Thomson on HUGO BOSS and Armel Le Cleac'h on BANQUE POPULAIRE VIII are currently leading in the Vendee Globe sailing race. RORC Transatlantic Update: Phaedo3 victorious in Grenada: RORC Transatlantic Race - Day 8: Lloyd Thornburg's American MOD70 Phaedo3 has taken Multihull Line Honours in the RORC Transatlantic Race for the second year running. The American MOD70 completed the course in 6 days 13 hours 39 minutes and 55 seconds. Although the team was outside their race record set last year (5 days 22 hours 46 minutes 03 seconds), Phadeo3 but well ahead of their closest 2016 rival, Giovanni Soldini's Italian MOD70 Maserati. Vendee Globe Update: Alex Thomson on HUGO BOSS and Armel Le Cleac'h on BANQUE POPULAIRE VIII are currently at the top of the leaderboard in the Vendee Globe sailing race. Vendee Globe Update: Alex Thomson on HUGO BOSS and Armel Le Cleac'h on BANQUE POPULAIRE VIII are a close 1st and 2nd at the top of the leader board in the Vendee Globe. Video above published Nov 30, 2016. Vendee Globe Update: Armel Le Cleac'h on BANQUE POPULAIRE VIII (1st) and Alex Thomson on HUGO BOSS (2nd) are currently at the top of the leader board in the Vendee Globe.